Many people who value a healthy lifestyle will also include alcohol but ideally they will also be looking at how they can ensure they’re “drinking smart” over the festive period. However, all too often, cosy evenings in are accompanied by a “relaxing” glass of wine and social nights out wouldn’t be complete without indulging in cocktails, wine with the meal and perhaps a nightcap to finish. Whist some scientific studies will identify health benefits associated with moderate alcohol consumption, many others will report increased risk of developing diseases such as cancer or liver disease. As such, alcohol is one of the queries I will address with virtually all my clients when helping them achieve their health goals. Without doubt, it will have an effect on your body and it is very easy to underestimate the number of calories you are drinking. An occasional drink or just one per day will not have too much of an effect on achieving your health goals, but more than this can and drinking smart is essential. If you’re frustratingly stuck on a weight loss plateau, or have found your waistline tugging at your clothes, addressing your drinking habits and drinking smart will go a long way to avoid the alcohol fuelled eating that will undo your week’s healthy eating. As with food, portion control is just as important to take into account for all drinks. When it comes to alcohol, there is no need to avoid it all together. However, no alcohol is healthy and it provides zero nutritive value. It is all about moderation, control and making good choices. It is not just about counting calories but also a question of looking at the whole health profile of a drink; its sugar content, whether it is hydrating and also whether it can provide any nutritive value. It is also important to remember that alcohol is a toxin and your body will prioritise getting rid of this toxin and this is the primary role of your liver; to detoxify and remove toxins. It also has a negative effect on blood sugars, causing surges and sharp dips to follow. These will be high in sugar and/or artificial sweeteners and possibly many other additives, like artificial flavourings, colourings and preservatives as well as chemical ingredients or salt needed to create these fancy drinks. Yes, this is an option, if you’re serious about drinking smart!! If you’re committed to staying on track with your health goals whilst out socialising, you’ll love this new range of flavoured coconut waters are the ultimate thirst quencher, hydrating whilst also providing electrolytes to maintain good mineral balance. Jeeva Naturals do a few fabulous flavours to choose from but my favourites are Ginger and Lemongrass or Mint and Lime over ice. Although originating from fruit, much of the sugar has been converted to alcohol during the fermentation process. With less sugar than beer and far less sugar than flavoured ready-made alcoholic bottled drinks, wine is a much better choice. Red wine, with its dark red colour contains the antioxidant Resveratrol. However, whilst this often justifies the consumption of red wine, bear in mind that you would need to consume a significant amount to provide the antioxidant benefit associated with improved heart health, for example. You can consume these same antioxidants in dark red berries and red grapes themselves, without the accompanying alcohol. White wine and red wine contain similar calories but white wine tends to be lower in alcohol, which can account for the varying amount of calories in a glass. Bear in mind also that a Rosé wine, which is sweeter will contain more calories and dessert wines are sweeter still. Champagne is a sparkling white wine and can have fewer calories than a glass of white wine (or beer). Although it does contain antioxidants, these are limited and of little nutritive value. A Champagne cocktail, by combining a more dry Champagne with orange or grapefruit juice will provide a little vitamin C and will also allow you to drink less alcohol for the same size drink. Beer is made with grains and is therefore very high in carbs and consequently sugar. 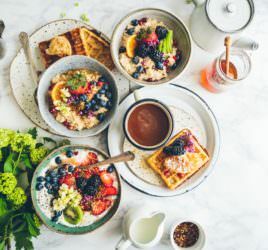 Ideally, this is best avoided or certainly limited, otherwise you’ll find that you’re consuming too many calories and also playing havoc with your blood sugar levels. That said, there are plenty of light lagers/beers that you can opt for instead. These will be lower in sugar and calories and of course, alcohol. If you’ve yet to give these a go, you might be pleasantly surprised with some of the varieties; it’s a question of adjusting your mindset and finding one you like. It is worth noting that craft beers are often higher in alcohol and can be significantly higher in calories. Cider, made from apples can loaded with sugar. Although choosing “dry” or low-sugar varieties will contain less calories, they also contain more alcohol. Although these are hard spirits, they are without additives and sugar and therefore contain the least calories. Obviously if you drink the spirit neat or on the rocks, you will avoid any further calorie intake, otherwise you do need to be careful what you mix it with. Mixing your spirit with soda and a squeeze of lime or lemon or even a splash of tonic for a little sweetness is an ideal choice. Otherwise, although I do not normally recommend “diet” drinks, a diet mixer, for example a diet tonic or cola, would ensure your keep your calorie intake in check. Adding a small quantity of juice is also a good alternative but a large glass will also contain a lot of sugar. Vodka based with tomato juice combined with Worcestershire sauce, tobasco and salt, this is a low calorie drink that even has some nutritive value. A good quality tomato juice will provide some antioxidants, mainly lycopene as well as vitamin C and potassium. Adding in more vegetables will provide even more nutrients and fibre. Be careful to ensure you are opting for a fresh tomato juice rather than a pre-made mix. Many bars will use ready made mixes to make their cocktails for ease and convenience that will be loaded with sugar and therefore calories. For example a Long Island Iced Tea not only contains a high amount of alcohol but also a “sour” mix as well as cola. A Daiquiri, rather than simply containing rum, lime juice and a small amount of syrup is more likely to come as a ready-made drink mix loaded with calories and additives. Frozen Margaritas and Piña Coladas are similar and can end up more like a dessert. If you’re drinking smart, these should be avoided as far as possible. You might be surprised to know how high in calories your usual alcoholic drinks can be. Use this alcohol calorie calculator to see how many calories are in different drinks. You can also use the calculator to work out how many calories you have consumed in alcohol over the course of a day or week.